Oops! Samsung Galaxy S III's Gorilla Glass can crack! We all have known and seen how strong the Gorilla Glass on all smartphones is. And then the successor Gorilla Glass 2 was said to be much more strong and thinner than its predecessor. But it seems that the glass has got some flaws and isn’t that strong. This comes to light in a sad incident where a new owner of the Galaxy S III happened to drop the smartphone on the floor, face-first from his pocket. And the result of the fall is as you can see in the picture above. 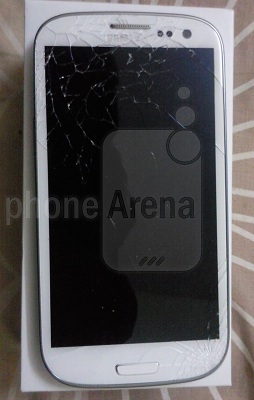 This is definitely not what the owner of the device might have thought would happen by just a fall, given the fact that, the S III arrives with the indestructible Gorilla Glass. But he now knows what importance a safety cover for the S III. We recently saw the Nokia Lumia 900 go in for a Hammer test where it was seen the smartphone itself was used as a hammer and the screen, which is also a Gorilla Glass one, didn’t happen to even carry a scratch, leave alone a crack. So it is indeed a very tough decision to make as to who should be held responsible for the crack but now you know one thing, that once you get your Samsung Galaxy S III, do not forget to carry it carefully to save a few bucks of your hard earned money on getting the screen changed.